Rose Garden Collective is a team of knowledgeable and experienced enthusiasts who love their job and do their best to provide the collective's patients with the top-notch cannabinoid medications. The company thoroughly checks the quality of the flowers and products to guarantee they do not contain mildew, pesticides or chemicals. The product range cannot but amaze: the shelves are filled with more than 50 Indica grades, and over 10 grades of Sativa and Hybrid strains. In addition, the collective can boast of having a wide variety of extracts, edibles, gear, and prerolls. Clients are the company's main priority, and it does everything possible to keep up with the customers' demands. Moreover, the workers are real experts in the sphere of medical cannabis and are always ready to provide you with a consultation. 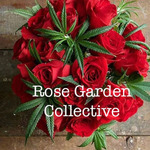 Rose Garden Collective offers special deals to its customers, so before making an order, make sure to find out what's hot now.